Welcome your employees into the business in a Professional manner in which your company Culture and Values are placed at the forefront. Reduce the amount of time your Managers and HR Team spend on processing and sending information to New Starters in your business. 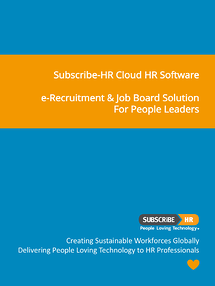 Let Subscribe-HR do the heavy lifting for your within our People Management Software Platform. No more sending e-mails and filing paper away in outlook for filing cabinets. Trigger HR BPMN Workflows to deploy information based on the start date of your people. Onboard thousands of Employees all at once, without having to click a button. 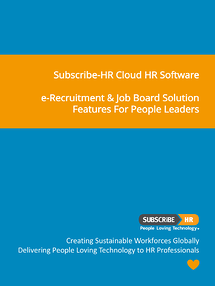 Simply Transfer the Applicant from e-Recruitment to HR and let Subscribe-HR do the work. Remember that having an integrated solution is key to reducing data entry and user login requirements. With one integrated People Management Software system, you can manage the whole life-cycle of people: Talent Sourcing, Employee Onboarding and Crossboarding, Core-HR, Self-Service, Surveys, Performance, Surveys, Pulse Surveys and Offboarding. One user name and password. One system. Employee Onboarding Steps can be set-up in a tailored manner to allow for your business to present a personalised onboarding service to your new people, people moving to new positions in the business and people exiting the business. Steps include: Offer, Contract (Electronic Signatures), Welcome, Tax Forms, Super/Pension Forms, Company Policies, Videos, Links to LMS, Surveys and more. HR Dashboards are set-up to present Managers and HR with Dashboard views of Historical and Current Onboarding Tasks, to improve efficiency, profitability and compliance. IP addresses are tracked for Sign-off compliance. Employees can withdraw themselves from Onboarding processes. HR and Managers can resend onboarding/crossboarding/offboarding tasks. Letter of Offer and Contract Templates can be sent for sign-off prior to sending to people, or edited/updated after being sent. All Functionality is mobile responsive. Get really clever and include Single Sign-On in your onboarding process, so when a new Employee Starts, one User Name and Password can be instantly created and used right across all your business systems. Use OneLogin or Centrify for this. Likewise, when someone leaves, deactivate users from one central point. Complete Onboarding (New Employee and Change Job) and Offboarding HR Automation. Onboarding can operate as a stand alone solution, or in conjunction with any of the other Subscribe-HR Solution. The Onboarding solution allows you to configure your own steps linking specific information to those steps for the Employee to interact with. The onboarding solution is completely mobile responsive.